A few weeks ago we stumbled up on an image, which we quickly pinned here, and it got us thinking about all the activities and games that were so simple in nature but have sort of fallen off the radar. 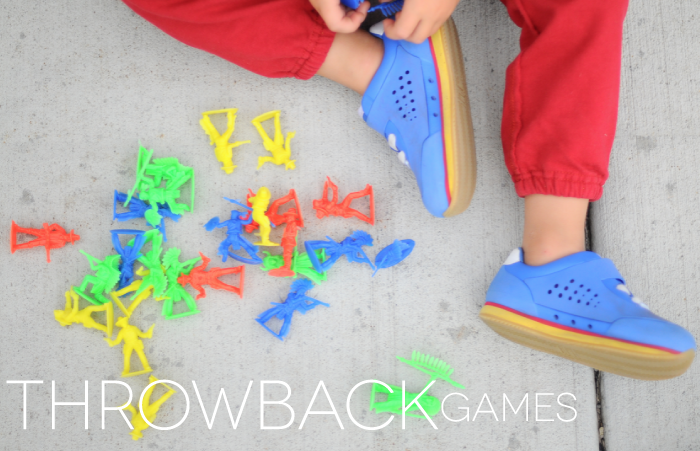 Games that our grandparents used to play, our parents, and even ourselves. We got really excited about showing our boys some of these and here’s a few we tried out together, a little Throwback Tuesday if you will. And because you know we love a good theme, we chad to use Appaman and Crocs perfectly retro pieces to help us dress the boys for the occasion. Army guys, sure our boys have seen them plenty in the Toy Story trilogy, but none of us actually owned any! 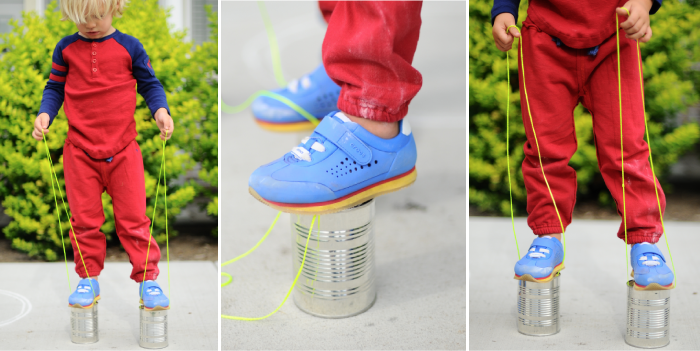 Can stilts! This one might have been a little over our preschoolers abilities, but it was a huge hit nonetheless! To make your own, you need two cans, with at least one lid per can in tact, both is even better! Puncture a hole with scissors and measure string up to the user’s hips. Then double that string length and tie each end in a knot through the can’s hole. Marbles! The shooter, the circle, the collecting, it all was long forgotten but quickly remembered. Hopscotch! It’s really not that forgotten of a game, but still one we hadn’t played with our boys yet. We thought of a few more games like four square, jacks, pick up sticks, and dominoes, can you think of any to add to the list? The boys are wearing Appaman’s Baseball henley in firebrick, vintage black, and pacific blue and the gym sweats in fire brick and vintage black. We also about died when we saw Crocs Retro Molded sneakers. They have such a great feel to them, wash easily, and keep their shape after hours of play. FUN! And thumbs up on the shoes. My mom was appalled that Parker did not have any sneakers so she took it upon herself to buy the ugliest shoes I have seen. Not to mention they made him walk like he had two left feet. I barely noticed the games because those sneakers are insanely cute! !